Organic search by app store users is an underappreciated element of mobile discoverability. While for some developers it won’t replace paid user acquisition that targets specific users, there are easy downloads on the table for those that implement a solid app store optimisation strategy. Utilising the right keywords can bring in users to your app for the small price of some extra time spent on your app page. A perfected page will also help convert visitors to users during paid user acquisition campaigns - it doesn’t just support organic installs, but also can lower effective acquisition costs (eCPI). 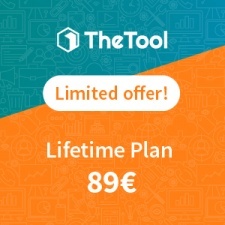 To help indie and small developers with their app store optimisation strategy, TheTool is offering a huge 95 per cent discount on its new Lifetime plan. Pay a single fee of €89 now and you can use the platform forever. TheTool acts as an all-in-one ASO and app marketing platform that helps hundreds of companies grow their businesses in the mobile ecosystem through data-driven actionable insights. The lifetime plan includes a swathe of features, including the ability to track five apps at a time. Developers can track, visualise and optimise their key performance indicators of the ASO of their apps in more than 90 countries, while also comparing their metrics against the competition. As well as tracking their own apps, users can also track one competitor per app. It also includes many keyword-tracking features that let developers explore the keywords used by competitors, from which they can get inspiration for their own. Various optimisation tools include installs per keyword, keyword suggestion, keyword density and much more. TheTool can be integrated into a number of third-party platforms to track downloads, conversion rates and revenue. These include Google Play Console, iTunes Connect, AppsFlyer, Adjust and Google AdMob. 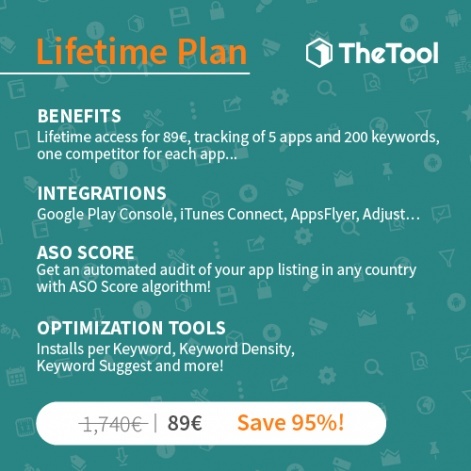 To help ensure developers have the best ASO optimization, TheTool also offers an ASO Score algorithm that analyses the elements of the product page to see if its ASO strategy is effective, as well as tips on how to improve each element of an app listing. All data collected by platform will be saved for 90 days, including correlations between visibility metrics, conversation rate, user feedback and installs volume. For further details on TheTool head to the website and claim your 95 per cent discount.